Derail protecting the UP mainline from the tracks exiting Gilroy station. This one is hydraulically activated and looks like it has seen a lot of use. 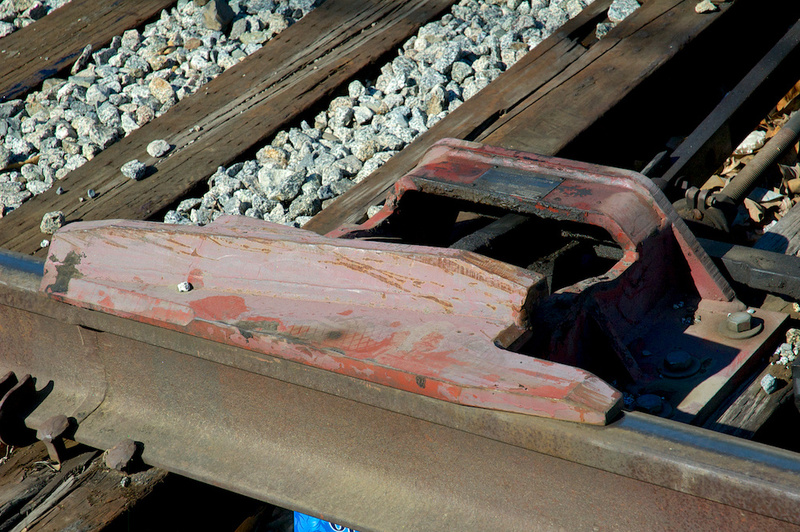 The scary bit is the scrapped paint, which suggests that more than one Caltrain consist has found itself sitting on the roadbed. Shot with the Nikon D70s and the 18-70mm f/3.5-4.5 zoom at 70mm, ISO 400, f/10, shutter 1/500 sec. Exposure, contrast, saturation, highlights, and levels adjustments in Aperture.